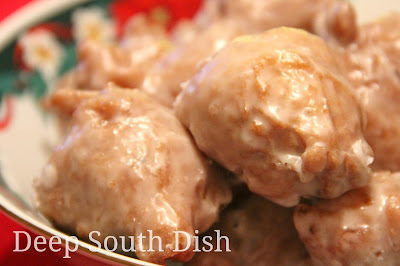 A traditional Mississippi Gulf Coast Christmas treat, this is my small batch version of pusharatas - a heavily spiced, drop fritter, made with apple, orange and lemon, raisins and pecans, and deep fried and finished with a dip in a thick powdered sugar glaze. I love pusharatas. Love. Love. Love. But, because of their history here on the Mississippi Gulf Coast, the best recipes are mostly huge batches, making hundreds! That is excellent when you are giving them away as gifts, of course, but sometimes you just want enough for your own cookie trays, so this year I wrote a smaller batch recipe. Most of the older recipes call for grinding up the apples, lemons and oranges completely whole - skin, pith and all, but I feel it makes the batter a little bitter and who wants bitter batter? I prefer to zest the citrus and peel and core the apples myself. Whisk together the flour with 1/2 cup of the sugar and the baking powder, nutmeg and cinnamon. Zest the orange and lemon and add the zest to flour; toss and set aside. Peel and core the apple and peel and seed the citrus. I had some smaller local satsumas, so that's what I used. I do pulse them in my food processor (or in my case, my Ninja these days) but don't puree them into juice, just pulse to chop. There's the apple peeler I love! Add the remaining sugar, stir to dissolve, taste and add more sugar if needed. Add mixture to the flour. 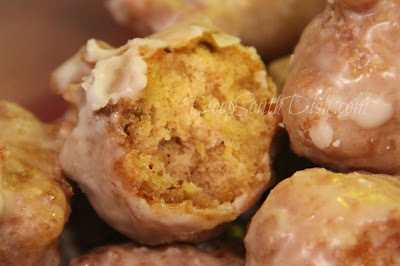 Add the raisins, pecans, whiskey, vanilla and only enough milk to form a thick batter. How much milk you'll add will depend entirely on how juicy your fruit was, but the consistency you're looking for is one of thick, cooked oatmeal. Let batter rest for 15 minutes. Heat oil in a deep fryer or a heavy deep pot to 350 degrees F. Use a small cookie scoop to drop small balls and fry, in batches, turning once until browned on both sides. Don't overcrowd the fryer. Drain on a baking sheet topped with a rack and let cool. You will need at least 2 pounds of powdered sugar for glazing, maybe even more. I know that seems a lot, but the glaze on these should be very thick. It's a bit of a messy job - the ladies at the Lodge wear food grade plastic gloves for dipping so that they can work through the batches quickly. This is why having help is handy, with one person frying and draining, another glazing. Dip the pusharatas in the glaze, rolling to cover, lift and let excess drip off and return to the rack to dry. I prefer to do the powdered sugar in batches rather than all at once. Small pieces tend to fall off as you're glazing and invades the smoothness of the glaze, so I make up a batch, dip as many as I can, rinse the bowl and make up another batch. If you place the drying rack over a sheet pan, you can scrape off the dripping back into a bowl and reconstitute it also. This batch should give you somewhere between 3 to 4 dozen balls, depending on how big you drop them. Pusharatas are best when freshly made and like any other doughnut, do not keep well for long, so never make pusharatas too far in advance. Although they may be frozen, they really are best when freshly made. I allow my pusharatas to sit, uncovered, overnight until thoroughly dry. Also, do not store them in a tightly covered container. They need to be only loosely covered, or presented in a simple paper bag, or a box, placed in individual paper cups. 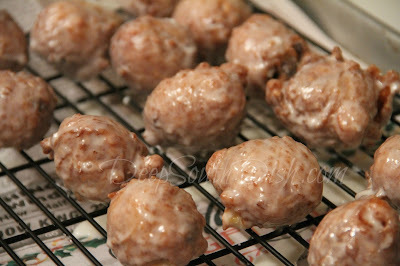 Covering them in an airtight container will soften your glaze and make them mushy. Here's how to make them. For more of my favorite Christmas goodie recipes, visit my page on Pinterest! Whisk together the flour with 1/2 cup of the sugar and the baking powder, nutmeg and cinnamon. Zest the orange and lemon and add the zest to flour; toss and set aside. Peel and core the apple and peel and seed the citrus. Chop the fruit, retaining the juices, or pulse in a food processor but do not puree. Mix fruit and juices with the remaining sugar, stir to dissolve, taste and add more sugar if needed. Add mixture to the flour along with the raisins, pecans, whiskey, vanilla and only enough milk to form a thick batter. How much milk you need will depend on how juicy the fruit was. Consistency should be similar to very thick cooked oatmeal. Let batter rest for 15 minutes. Heat oil in a deep fryer or a heavy deep pot to 350 degrees F. Use a small cookie scoop to drop small balls and fry, in batches, turning once until browned on both sides. Don't overcrowd the fryer. Drain on a baking sheet topped with a rack and let cool. Prepare the glaze in batches and dip the pusharatas, rolling to cover, lift and let excess drip off and return to the rack to dry. Cook's Notes: Pusharatas are best when freshly made and like any other doughnut, do not keep well for long. I allow my pusharatas to sit, uncovered, overnight until thoroughly dry. Do not store in a tightly covered container, as this will soften your glaze and make them mushy. If gifting, present them in a simple paper bag, or in a box, placed in individual paper cups. I've lived on the gulf coast my whole life and never heard of a pusharata. I guess it depends on what part of the Gulf Coast you are from, but for us on the Mississippi Gulf Coast, they are certainly a very big part of our history, especially in the Biloxi area where I've from, and a very big deal at Christmas! Now, if you're from another state here aong the Gulf Coast, you likely wouldn't know about them, but if you're from Mississippi Gulf Coast, that'd be quite surprising to me. I don't think I've ever met anybody here who didn't both know all about pusharatas, and also have a deep affection for them!! My husband grew up in Gulfport 52-78 and family still there. Had never heard of pusharata. They sound wonderful! Found an article from March that was in the Sun Herald. It's a Slavonian dish that is popular more so in Biloxi than other areas. This was very interesting. I have never heard of this holiday treat nor did I know what a satsuma was. Best wishes to you and all the readers for a Merry Christmas. Thanks so much and Merry Christmas and a Happy New Year to you! Hi Mary, this sounds really interesting...though I have never heard of it before...bookmarked!! Let me know if you try them Nisa! You have MADE my Christmas!! My grandma made these for all the weddings and gatherings, and I remember many weekends at her home as a teen, helping to make them. The recipe was never written down, and this is the closest I've ever found. Thank you so very much! Merry Christmas!! Fabulous recipe Mary! I don't deep fry but if I did I would make this without a doubt! Thanks for sharing and Merry Christmas! I believe that pusharatas on the coast come from the large Slavic community. I have in-laws that are Yugoslavian and their recipe for it is a very old one that their ancestors brought with them. Although I've never made them before I've had the pleasure of eating them. MMMmm Mmmm... they are so good! Thanks for this recipe, with the smaller batch I may give them a try now. You are correct! There is much more about them in the big batch recipe linked in above in the post but they originated here on The Point in Biloxi where my Mama grew up and were adopted by all of the immigrants. The Hook Up is actually a new restaurant here but the original Slovenian Lodge ladies auxiliary still make and sell them every Christmas. Mama's recipe as well as Miss Deenie's recipe from The Lodge are included in that big batch link above also. Pusharatas are highly sought after every Christmas! Mary, I loved reading about this. You know that I’m a Gulf Coast girl, through and through, but I’ve never heard of these. I hope you keep the tradition alive! Highly prized here in Biloxi, but it's very regional to us over in Mississippi I think as it came over with those in the fishing industry on the Point way back in the day! I've been waiting and watching when the ladies make these to order some, but have not heard anything. They were for sale this past weekend at the Biloxi downtown event, and you can find them at various festivals, but have you called the Biloxi Slavonian Lodge about the Christmas orders? I think you almost have to "know somebody" and orders are taken early so it may be too late. I think pickup is the day before Christmas Eve. Too much to keep up with so I make my own! !